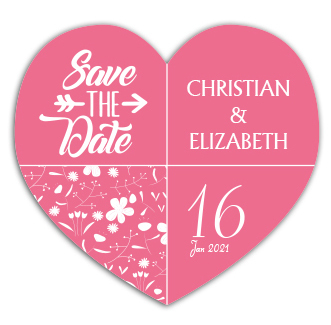 Promotional 3.25 x 3 heart-shaped save the date magnets can flutter the hearts that see it. Along with reminding them about your special day, it will hold interests of onlookers with its typical shape. People would love to retain it as a refrigerator art and an affectionate token. This magnet can divert all attention towards the surface, where it is affixed. It is for sure that your union and its liveliness will be fresh in minds of onlookers who view it regularly.